Geographicraft (Climate Control for 1.8 and later) 0.8.9b released. Serverside crash in 1.12 fixed. BoP biomes only work in the BoP or RTG worldtypes. Mountain chains! Mountains can now be set to appear mostly in mountain chains. A great option to add interest to large land areas. Latitudinal climates with Frozen Oceans option. Note use of start location option to place the hot zone at the equator but the spawn in a temperate area. Current supported outside mods are RTG, Biomes o' Plenty, Highlands, and Thaumcraft. Biomes o' Plenty and Highlands have both made changes that restrict usage. BoP will only place decorations in the BoP and RTG worldtypes; GC can place BoP biomes in the overworld but they have nothing in them. Highlands has tuned its terrain generators to its own noise generators, available only in its worldtype. Highlands biomes can be placed in other worldtypes such as Default and BoP but they look very different from the intent, generally having an "amplified" feel. As a result, the defaults for intervening in BoP and Highlands worldtypes have been changed to "true". Defaults for climate incidences have been changes to 1/1/1/1 from 2/1/1/2. Generally 1/1/1/1 is better for oceanic worlds and 2/1/1/2 for continental ones. Feel free to change to suit your taste, of course. Set climate zones to smaller, more manageable sizes so you can find a variety of biomes more easily. Change the frequencies of common biomes and climate zones to occur as often or as rarely as you want. Prevent hot biome-cold biome transitions, or mix all the biomes together. Restore true oceans to vanilla, or keep a universal continent with large lakes. Create a variety of land sizes, from giant continents tens of thousands of blocks across to islands that fit on a single map. Move biomes from one climate zone to another. Turn the oceans into giant deserts, endless jungle, frozen ice plains, or vast mountain ranges, if you want. Fill the oceans with islands of your choosing. Rearrange temperate zones to make warm and cool zones distinctive. Put mountains or forests into hot zones as oases. Also removes the tiny islands out in the ocean. For Climate Control users: the config files have been renamed but the content is the same. 0.8.8 Modified to work with the latest BoP version, and pre-1.12 renamed to indicate it will not work with 1.12. 0.8.7 Fixed a startup crash. Added an extreme climate separation option, to make taiga-desert junctions even rarer at the cost of making Snowy and Hot climates less common on continents. 0.8.3 Matched up to current version of BoP biomes and sub-biomes. See Curse download page for details. Altered config to increase average landmass sizes. There is an option to use Mesa as the border for Mesa Biomes rather than Desert. Note: you may see occasional chunk glitches on the borders of previous exploration if updating an existing world from earlier CG version. I have only seen a few in 10's of thousand of blocks along the exploration border. They are to terrain a few chunks away, not the monstrous chunk walls you can get in vanilla. 0.8.0 - fixed a bug in world with "SeparateLandmasses=true" which broke up landmasses into archipelagos. Altered landmass formations algorithms. Slightly increased the land proportions. Also, bug fix for Mountain Chains = true in 1.11, and an option to turn GC on for custom worlds. Since the formation algorithms have changed, you will get chunk walls if you update from earlier version and have turned off the chunk wall prevention system. 0.7.7 - Set to run on 1.11 as well as 1.10.2 and 1.9.4. Name changed for clarity. 0.7.5 Added SEA climate (both ocean climates). Put in attempt to dodge bug created if the IntCache is reset by other mods or multitasking. Added "Mountain Foothills" biome in BoP worlds. Removed rivers from frozen oceans. 0.7.2 Bugfix for sometimes overwriting other mods' custom village generators. How the world-specific configs work. GeographiCraft uses configs differently from the standard Forge model. It keeps a separate config for each world, and uses the "standard" config file only for new and imported worlds, and only to create their world specific configs. The important configs are stored in the worldspecificconfig folder in each world's save directory. This file holds the settings for that world. Changing the config file for a different world or the general config file in the general config folder will have no effect whatsoever on a world with it own worldspecificconfig. You can have as many different worlds as you want, each with its own settings, and switch back and forth between them without any config fiddling. The only exception is biome sets; the assignment of IDs to biomes is set by the biome mods you have, not by CC. You can use CC to make some biome not appear in any given world, however. The general config is used for new worlds, and for worlds that are being switched to GeographiCraft. When the world is first run under CC, the current general config is effectively copied to the worldspecificconfig folder. That then becomes that world's config and can be edited to change that world's settings without changing other worlds or any new or imported worlds. GeographiCraft can prevent most chunk walls resulting from changing your biome set or biome placement. Be cautious using this on any important world. First of all, bugs! Terrain gen bugs can leave big ugly footprints in your worlds. Make a backup of any important worlds. Climate zone are smoothed if you have climateRingsNotSaved 0 or larger. If you want the new biomes but with the vanilla land and climate system, there's a config setting. You can make reports here, to my email (see my profile), or on Github. First, install Forge 1450. It might work on earlier or later versions, but no promises. Second, start GC with any biome mods you intend to use in you mod folder and quit without making a world. This is to create the config files. Third Go in and edit the config files. First, you need to decide the "style" of changes between one world and another. "Biome Locking" requires a larger space between explored areas but produces less-jarring junctions between old and new terrain and produces chunk boundaries very rarely (I may have seen one in about 20 worlds I've looked at). "SubBiome Locking" needs less space between explored and new areas, but the junctions are more obvious and you see occasional 64x64 "chunk corners" although mostly near water and so with low walls. If you use the Biome Locking option, set biomeRingsNotSaved=3 and set subbiomeRingsNotSaved=-1. This will produce a boundary of roughly 800 blocks between the last place you travel and where the new terrain starts - but with a LOT of variability. If you use SubBiome Locking,biomeRingsNotSaved=-1 and set subbiomeRingsNotSaved=0,1,2 or 3. I've only tried 0. Higher numbers will reduce the boundary area but increase the chance of chunk walls. A value of 0 will produce a boundary area about 400 blocks across. Each extra ring not saved should move that in 64 blocks but at some point the chunk walls will reappear. Second, set "No Generation Changes" to true. This will make GC You can go ahead and change the generation configs to what you want after the change. Either open an exiting world with CC or create a new world. If it's an existing world, there may be a long delay (several minutes) while CC determines the generation plan for the world and saves then to disk. Then, quit Minecraft (not just the world, you have to quit the program). Go into the new worldspecificconfig directory in the world save file and edit the configs to produce the kind of world you want. Normally, for imported world, that just means setting "No Generation Changes" to false. You can already have set everything up for what you want in your general config and just have "No Generation Changes" set true; but you should review the other configs to make sure they are right. Then, restart Minecraft, open your world, and fly around to see what the boundaries look like! The four land configurations each set the frequency with which particular land sizes appear in the world. For all the land sizes, there is huge variability - land sizes can easily be half or double the stated values. Plus, land formations can appear on top of each other in which case they merge. Land usage is complicated so I'll describe it with a "land usage" score, which can later be converted into a percent. "Large Continent Frequency" sets the frequency of large continents, very roughly 8,000 by 16,000 blocks. These are about the size of continents in 1.6 generation. They have a land usage equal to about the frequency you set. "Medium Continent Frequency" sets the frequency of medium continents, very roughly 3,000 by 6,000 blocks. There are about the size of a small continent on a 1.6 map. They have a land usage equal to about 3/4 of the frequency you set. "Small Continent Frequency" sets the frequency of small continents, about 1,000 by 2,000 blocks. This is smaller than anything the standard 1.6 generator ever makes. They have a land usage equal to about half of the frequency you set. 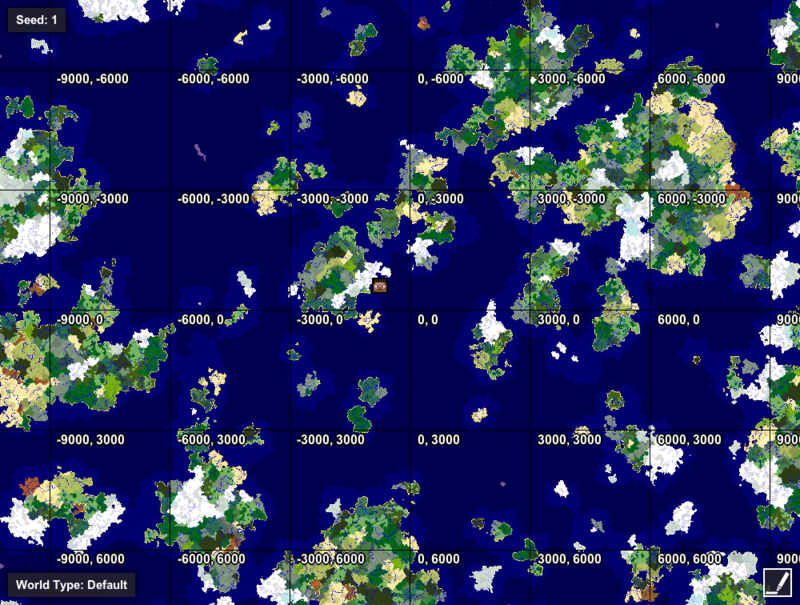 "Large Island Frequency" sets the frequency of large islands, about 500 by 1,000 blocks. This is similar to the large multibiome islands you occasionally see in the large lakes of 1.7 generation, except that in 1.7 the larger one are essentially always merged into the universal continent, so the ones you see in GeographiCraft tend to be larger. They have a land usage equal to about 40% of the frequency you set. 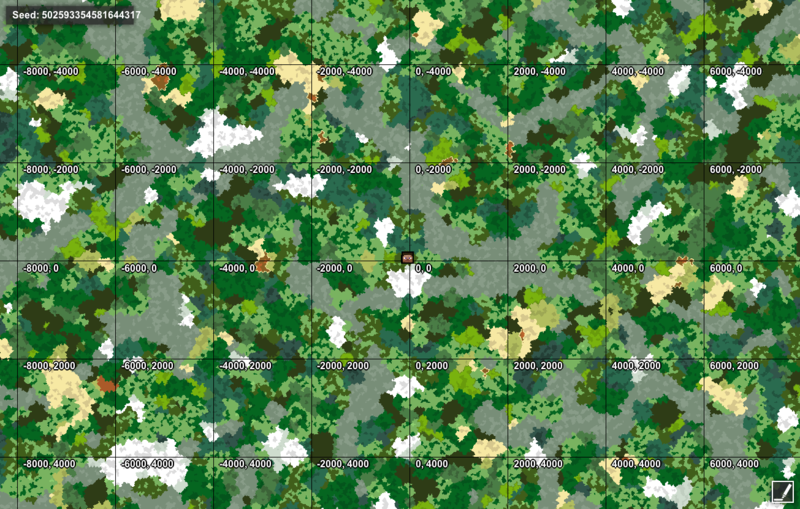 "Medium Island Frequency" sets the frequency of medium islands, about 250 by 500 blocks. They are always one climate only. Universal ocean or universal continent? SeparateLandmasses usually determins the oceanic vs. continental character of the world. The defaults, and almost any setting with more land, produce an oceanic world with separateLandmasses=true and a continental one if it's false. If you have substantially less land than in the defaults, the world is oceanic but with more land and larger landmasses if SeparateLandmasses = false. Ocean trip length: This is probably the factor people are most interested in, and I'm sorry there's no simple answer or formula. Very roughly, if you hit the nearest land, your crossing distance will be on the order of the size of your continents. So in a world made of large continents, you have a typical crossing of 16,000 blocks. 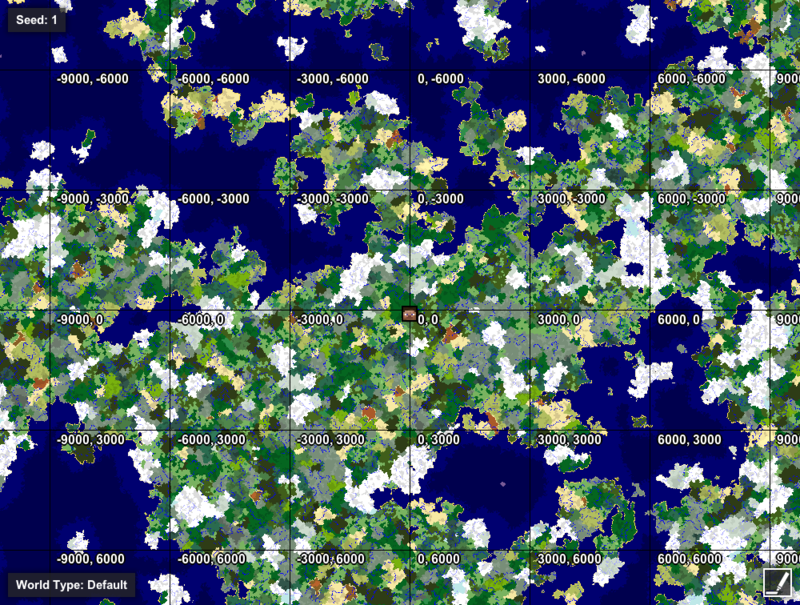 in a world of large islands, it's about 2,000 blocks. If you have a mix of continents, you'll have a similar mix of crossings. So in a world half large islands and half large continents you'll get a 2,000 crossing half the time and a 16,000 crossing half the time. 1.7 worlds are actually about 90% large islands and 10% large continents and that's why usually ocean crossings are really short but every now and then you get a 10K whopper (by going the length of a skinny lake). If you've got a universal ocean, you may miss the nearest land. In a busy ocean world, you will sometimes about double your crossing distance that way. In an open ocean, you can miss land after land and go on for a very long trip. 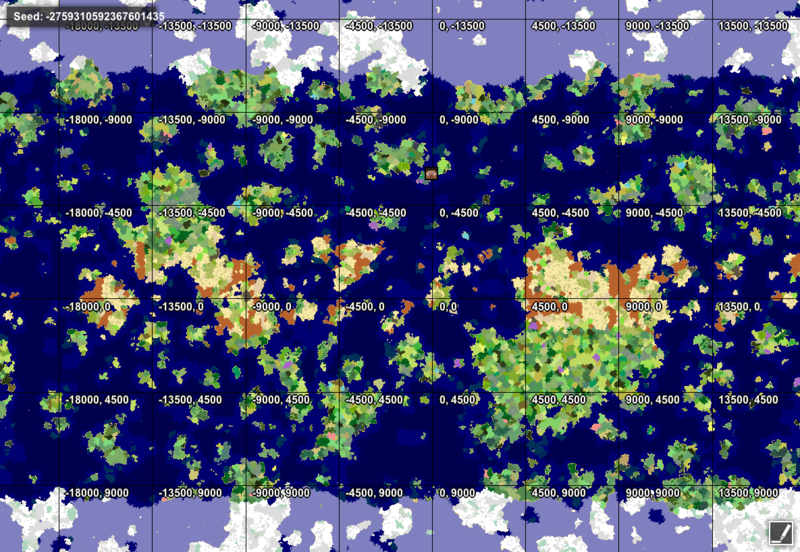 The GeographiCraft defaults produce a "box of chocolates" effect on ocean crossings just like land forms; mine have typically been 2,000 - 10,000 but looking at maps I think you might see ones as long as 20,000 without being fluky. The defaults create a world with a wide variety of land structures, from oceans scattered with islands to massive continents. Climate zones still exist, but are smaller than in vanilla, roughly the size of snowy zones in vanilla 1.6 and before. Mod Pack Policy: You may include this mod in a modpack provided: 1) You provide attribution; 2) You provide a link to this thread, the Planet Minecraft post, or the Curse download page; and 3) You do not use the modpack for any financial gain, including AdFly links and the like. Does This Change The Way That Villages Spawn? There are configs that allow villages to spawn in biomes that they wouldn't normally spawn in. The defaults are set to the vanilla biomes (desert, plains, and savanna) Otherwise it doesn't change the mechanisms. However a village that wouldn't spawn in a given spot in vanilla may spawn because the biome or terrain are different and vice versa. This is an amazing idea and looks great, but how did you load up your world map with AMIDST? I'd like to make sure that I like the variation of continents I have, and i can't seem to view the world. I would have to modify AMIDST to work with Climate Control/Geographicraft. I currently haven't been able to get it to match up, here's a version that should have the right average size of landmasses and climates. That pic was made with a considerably older version for which I did have a matching AMIDST. Since BoP for 1.8 still seems to be alpha I haven't gotten around to doing the bridge. I'll take a look - it's pretty routine and I can probably get it done in a couple of days. That's a pity, coz I got BoP and it worked for me. and would love to use your mod as well. Though I had to start a new world and have it set to BoP world type. I also hope you can get it to work. What versions of Forge and BoP are you running? I'm using the Forge 1521 which when I last checked was the latest version and I am also using Bop version 1.8-3.0.0.1448-universal. Though I have JUST noticed that BoP has been updated. I'll be trying the updated version... to see if it still works or not. When will it be out for 1.9? Or rather, will it be out for 1.9? Zeno, can you add this thread to your sig, so it's easier to find this thread? If one doesn't know ahead of time that "Climate Control for 1.8+" is "GeographiCraft", it's hard to search for it. I'd like to, but signatures have a size limit and I'm at it. When you make the 1.9.4 version, could you name it ClimateControl again? It fits much better. I'd actually disagree with that. You wouldn't expect a mod that controls climates to raise mountain ranges or shrink or grow continents. On top of that, when you google "climatecontrol" you get forty million pages on air conditioning. Even "climate control mod review" gets over a million bogus pages on air conditioning. "Geographicraft" already tops the page with the mod and the only conflicts that show up are National Geographic rafting expeditions, and only about a 1000. A mod review for Geographicraft from a minor blog could actually be found with a search engine. Update to 0.7.1 Contains major bugfixes for intermittent crashes, missing rivers, loss of M-biomes with river suppression, and config changes for a default continent start and more land. Geographicraft updated to 1.9.4. ZenoTechnology is not required for this version. BoP biomes only work in the BoP worldtype. I guess I should of replied too this thread instead of the old one. Do you know what would be cool? More examples of what the different land combo's might bring. I been creating a few for fun but it takes a lot of traveling time too see what I get with each change to the config. I assume in the pick that we are seeing some medium continents right? I also look forward too trying out UBC for 1.9.4 as well. ForgeAmidst by Sedridor is awesome for looking at worlds.